We has a T-shirt shop (for some reason)! We don’t actually expect anyone to buy anything from it, you understand, but having a T-shirt shop was one of the things on our To Do checklist after sorting this website, Facebook and Twitter etc. So now we has one, with the tiniest of mark-ups (about a quid per item, which would go towards the printing costs of our fanzine). So if anyone gets drunk enough to fancy some shonky BRATS merch just click on the photo above. Now we must go and pack for a super-early start to head up to Glasgow for the weekend’s Rockers bout – yay can’t wait! We keep thinking there was some info re the bout we meant to find out before setting off, though… oh well, we’re sure it’ll come to us at some point. It’s almost precisely a week from now – Saturday, around noon – and we’re sat in a pub in Glasgow, excitedly anticipating the imminent Brighton Rockers away bout. Then things start to unravel. We haven’t exactly planned things with military (or even civilian) precision, you see. “Do we know even where the bout venue is?” one of our number asks, peering confusedly at an A-Z of Gloucester they picked up at the airport in a mistaken rush. “We must have time for another pint or two, or at least a few more Jägers each,” says a muffled slurring voice from under the table. “If only we knew the actual start time. And the location. And the nearest pub or supermarket to it,” says the person looking at the map of Gloucester. “I wish there was somewhere I could look at photos of roller derby tomorrow whilst eating vegan chilli and cakes,” says a passer-by, for some reason. “If only we’d found all this stuff out in advance,” say I, banging my head repeatedly on the table to create a sound almost as annoying as a Simple Minds record. The most chilling words in the first issue of our Rockers fanzine were those of Glasgow’s Rogue Runner saying “we play in a sports hall, so no bar unfortunately”. Aaagh! Most sports halls have bars of some description, but not Glasgow – indeed we understand the entire university campus the venue is based in (Glasgow Caledonian University) has no bars. The only other ‘dry’ derby venue we’ve encountered is the one in Dublin – we just need to learn that the Munich and Prague derby venues are dry too for all our preconceptions about Europe’s boozing capitals to be crushed! One particular place we’ll stick our neck out and recommend cafe wise in the West End is Cafe Phoenix. Located on studenty Woodlands Road, it’s much closer to the centre than the aforementioned Byers Road. Cafe Phoenix is derby player run and is currently home to the first exhibition of GRD photographer Dave McAleavy’s pictures – the exhibition runs until the end of April and features pictures not just of the Glasgow league but from bouts across Europe and the 2011 Roller Derby World Cup. The cafe – which offers meat and vegan fare alongside coffee and cakes – is also a second-hand bookshop (hey, that makes it more Brighton than even Brighton is!) and they have promised us that “all derby players get a 10% discount, so tell people to ask for that when they come in”. Now we just need to work out which Rockers players to disguise ourselves as to take advantage of that offer ourselves. Any ideas? It certainly hasn’t passed us by that the National Museum of Roller Derby is based in Glasgow. Still in an early incarnation, the first five derby leagues who became ‘affiliates’ (supplying bout programmes and posters etc) to the museum include the Brighton Rockers, alongside London Rockin’ Rollers and the leagues from Glasgow, Edinburgh (Auld Reekie) and Aberdeen (Granite City). 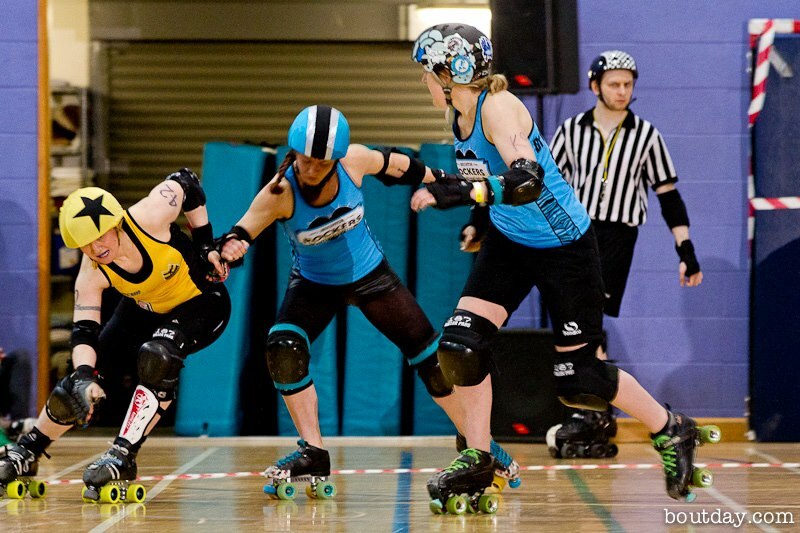 The two UK-wide derby magazines – Lead Jammer and Inside Line – are also affiliates. In summary, an awesome repository of printed material we rather fancied a look at. Unfortunately at present the Museum is in the process of moving (alongside its host Glasgow Women’s Library) to a new location where it will have a more permanent home, and is seemingly boxed away in the meantime. We’ve been trying to gain ‘tour party’ access to the archives over the GRD v BRRD weekend, but with no joy. At the very least, if you happen to walk past the current GWL location (Berkeley Street) please doff your cap in the knowledge that somewhere in their basement there’s a mini-history of the Rockers awaiting its new home. Other museums are open. Even on Sunday. And free. As Jimmy McGee mentioned in our fanzine preview. He also recommended wandering round Glasgow Uni and Kelvingrove Park (both West End and “beautiful”) and a trip to the Barras (Glasgow Barrowlands) flea market on Sunday. GRD’s Rogue Runner recommended a trip further afield for fresh air seekers: “Loch Lomond is always good.” We know of a few BRATS types who are already incorporating a side trip to Edinburgh – 45 minutes up the road/rail – but we’d advise other travelling Rockers fans to stick with enjoying Glasgow itself this time out. If reliable web sites are to believed we’ll have a whole other weekend to experience Edinburgh in late October – cheers! We look up. The BRAT with the smartphone has finally connected to our half-arsed website in the pub in Glasgow almost exactly a week from now – Saturday, around noon. Oh well. No loss. We’d all expected as much. As if WE could have done any sort of practical bout preview. Pah!